The 1992 and 1993 Toronto Blue Jays World Series wins. These are special for me as they were the first (and second) time I saw my favourite team in any sport win a Championship. Both times I feel asleep only to be awoken for the last play, once by my Dad (1992) and once on my own (1993) I awoke just in time to see Joe Carter end the game with one swing of the bat. The call “Touch ’em all Joe, you’ll never hit a bigger home run in your life!” by then Blue Jays broadcaster Tom Cheek still gives me chills. The 49ers are my favourite football team and in Super Bowl XXIX I got to see them crush the Chargers on route to their 5th Super Bowl. To this day, it is the last time I have seen my favourite team in any sport win a championship (Get it together Vancouver Canucks and Toronto Raptors! Just kidding Raptors, you are terrible). Speaking of the Vancouver Canucks, they have proven to me that winning doesn’t always trigger nostalgia; losing in heartbreaking fashion can do that too. Oh yeah. I was 10 years old when I saw my beloved Canucks come back from a 3-1 series deficit to the New York Rangers forcing game 7 only to lose by a goal (3-2) in the deciding game. I still vividly remember feeling sick to my stomach and not wanting to go to school the next day. Although, I’m sure some part of that was to avoid the mocking I would no doubt receive from my friends at the time who were all Toronto Maple Leaf fans (the team which happened to be knocked out in the Western Conference Finals by the Canucks on route to the Stanley Cup Finals). Now I am going to get Canadian on your asses. Anyone who is not from Canada does not understand how big the World Junior Hockey Championships are here. In fact if you are not from Canada you probably don’t even know what they are. In a nut shell the best hockey players (under the age of 20) represent their respective countries in a tournament every Christmas season to crown a world champion. However do to Canada’s unmatched ability to develop young hockey player into stars at such a young age, our top players are often in the NHL. In 2005 that was not the case. There was an NHL lockout and all of Canada’s players were available to dawn the red and white. 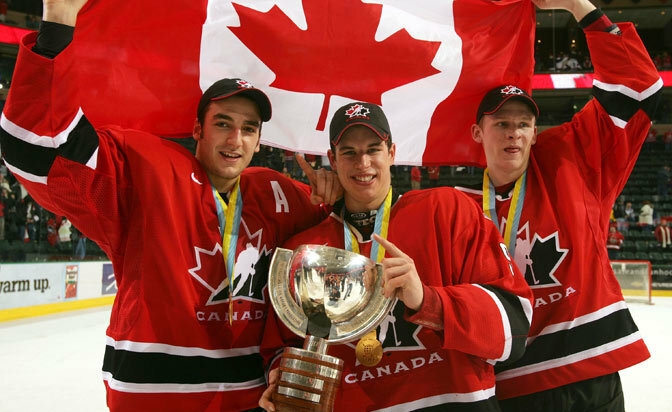 That year Canada sent (in my opinion) the greatest junior team in history. That year, myself (now in my 20s, the prime age to really start appreciating sports) and all my friends watch while Canada, with names like Sidney Crosby, Corey Perry, Patrice Bergeron, Ryan Getzlaf, Mike Richards, Dion Phaneuf, and Shea Weber (just to name a few), crushed their opponents (including a Russian Team featuring Alex Ovechkin 6-1 in the gold medal game) going undefeated to capture the World Junior Hockey Championships.